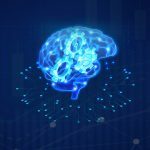 Artificial Intelligence (AI) is emerging as a key factor, within the finance industry, toward increasing revenues and achieving business goals. From providing value-based business strategies, improved customer experiences, increased revenue generation and reduced costs, AI is establishing itself as a significant technological advancement to achieving business success. Top management is now viewing AI to assess business areas that are poised to substantially benefit through advanced analytics and deploying it to achieve the desired outcomes. The natural evolution of technology for business benefits, which took us from paper-work to the internet, is now swiftly transforming toward AI, and the Finance industry is no exception. The heavy volumes of data involved in the finance sector, make this technology a primary resource toward business benefits. The process of pattern establishment and identification is a key advantage that has attracted increasing attention toward the analytical capabilities of this technology. Although AI comes with innumerable benefits for the Finance industry, there are also some concerns with regard to trust, bias and regulatory compliance. Hence it is prudent to view the technology as a means to assist human endeavors, rather than the replacement of human involvement. This type of Artificial Intelligence is a specialized form of the technology that looks into a particular area of the business and fulfills a specific duty. The process is highly specialized and the deployment of the technology offers only those specific solutions. The tasks assigned to AI are narrow and it adheres only to its set protocol. An example of Narrow AI is ‘Apple’s Siri’. This intelligent technology is designed to gather information from the internet and hold meaningful conversations with a human. However, the technology is very specific and narrow in its approach, wherein it is only designed to address the specific demands of its system. Any requests that go above and beyond to offer holistic solutions, cannot be accomplished. As the name suggests, this version of Artificial Intelligence is more holistic in nature with a wider purview and the ability to offer solutions that are all-rounded and meaningful. Its capability and functionalities are more encompassing and of a higher standard and it is geared toward offering analytics that extend beyond specific areas, by collecting information from various arenas to offer an overall solution. Strong AI is a close replication of the human mind and is capable of conducting analysis in an error-free fashion. Lack of identification of patters: Human involvement makes identification of patterns a fairly sub-standard phenomenon. This is usually done in special case scenarios, and even then, is prone to slips and errors. Unprofitable transactions are rarely examined and identified. 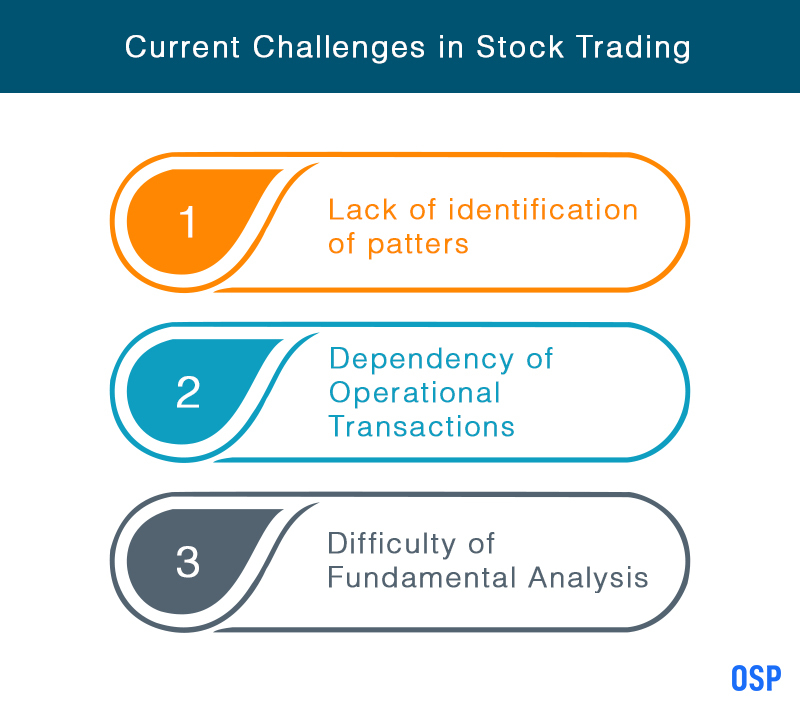 Difficulty of Fundamental Analysis: Human attempt at fundamental analysis to identify the strength and weaknesses of the market is usually undertaken in a sporadic and inefficient manner, due to the large volumes of data required to analyze. This leads to market misconceptions and high rates of emotionalism. 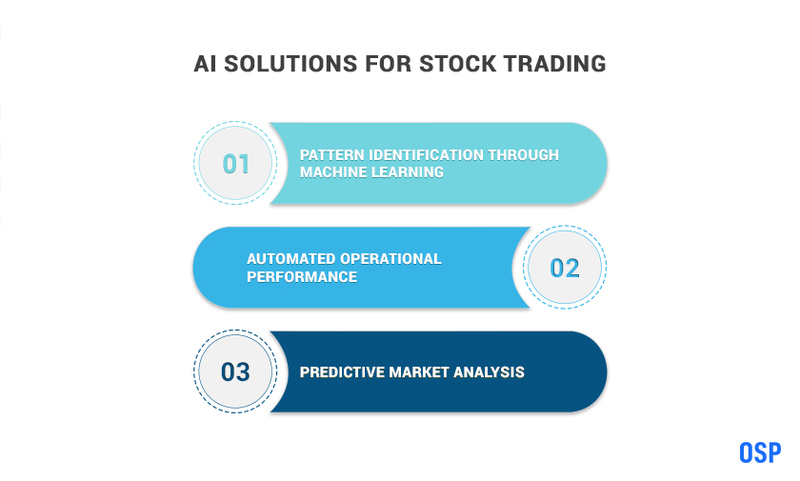 Pattern Identification through Machine Learning (ML): Machine Learning is one tool of Artificial Intelligence that can create brand new systems to swiftly spot patters and notice traction with suggestions for improvisation through its financial applications. This further includes the identification of unprofitable transactions. Predictive Analysis Capabilities: AI technologies can further predict patters and offer suggestions toward the same. This is done through automated and extensive research from social media and other online platforms that are cumulatively analyzed to gauge market feelings and trends. These automated research tools can then make forecasts about likely market movements.